These essential questions, grounded in Peter Drucker's theories of management, will take readers on a exploration of organizational and personal self-discovery, giving them a means to assess how to be--how to develop quality, character, mind-set, values and courage. The questions lead to action. By asking these questions, readers can focus on why they are doing what they are doing in their work, and how to do it better. 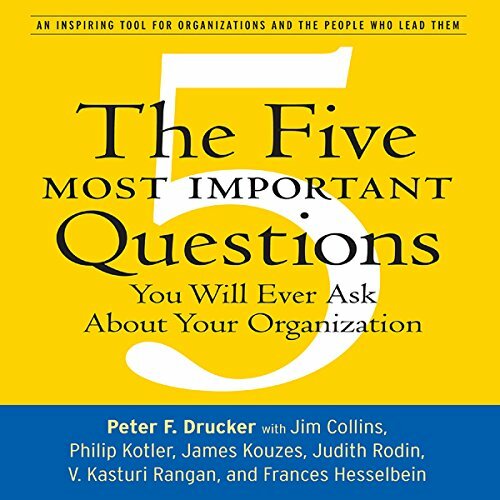 Designed for today's busy professionals, this brief, clear and accessible book will challenge readers to ask these provocative questions and it will stimulate spirited discussions and action within any organization, inspiring positive change and new levels of excellence, helping all to envision the future of theirs' or any organization. 1. What is our mission? 2.	Who is our customer? 3. What does the customer value? 4. What are our results? 5. What is our plan? These five questions weave together a process of reflection an organization can undertake to determine its current reality and chart a future course. For those interested in further inquiry, Drucker lists a number of additional questions for additional exploration. What did you love best about The Five Most Important Questions? While preparing for a job interview I listened to The Five Most Important Questions present a logical way to define your organization. The questions asked help sort and prioritize organizational goals. I can see using this book to prepare for a business presentation. It did help my interview. Since it is a short book you will want to listen to in in one sitting. But you can break it up or listen to certian parts over again. It is full of good information. A very dry listen- hard to get excited. Though this book covers great topics, its delivered in a way that is dry and boring and hard to follow. It may be better in print where the overview can be revisited readily. I find it easy to get lost in "which of the 5 questions is he talking about now?" The narrator is dry white toast boring. Erik Synnestvedt - THE WORST NARRATOR EVER! It's not my intention to attack the narrator but his NASAL VOICE AND POOR ENUNCIATION made it unbearable for me to listen to this audiobook. I've always considered Peter Drucker (and Philip Kotler) to be one of my personal heroes but the narrator killed it for me! NO WAY! I'm sorry Erik but please if you couldn't improve your nasal voice, at least try to work on your enunciation. The midst effective book to assess your organization. I plan to buy a hard choir and use it as a handy reference.